My in-laws came to South Philly to help around the house once again (this may become a recurring theme on the blog.) By help, I generally mean my mother-in-law and I hanging out and my father-in-law and husband painting, tiling, spackling and/or sanding. When they come down, we usually “do work around the house” for a few hours and then head out to lunch. Last time they were here, we tried to go to Green Eggs Cafe, but didn’t want to wait and happily ended up at Stogie Joe’s instead. Green Eggs Cafe is a relatively new bruncherie at 13th & Dickinson with a second location in Northern Liberties. My husband and I visited a few times when it first opened and always enjoyed the food but the service was just…off. You know, we had to ask for utensils, ask for drink refills, ask for our toast, etc. And we always sat at the counter. The thing that burned me up the most was that the owner was always there, but was he working? No. He was always just sitting around, hanging out. It’s important for me, especially in neighborhood establishments, to feel welcomed. Why do I like Green Aisle and Fond and Black and Brew so much? The owners are present and friendly and accommodating. I just wish he wouldn’t rest entirely on the fact that a place like Green Eggs was sorely needed in the neighborhood. Take the extra step, dude. Stepping off of my soapbox. Anyway, the in-laws, husband and I headed over there for a very late lunch (around 3pm) on a recent weekend and was told there would be a brief wait. No problem. 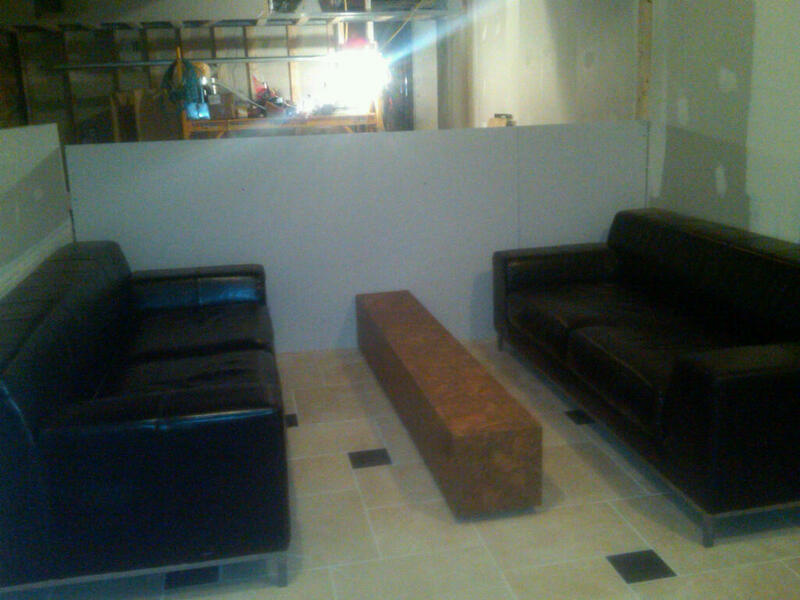 It seems as if they took ownership of the space next door which was being turned into a comfy little “waiting room” while the space where these couches previously were is now occupied by tables. There’s still a little work to be done but Green Eggs is definitely making better use of their space by adding tables to what was previously a pretty open area–and the previous resting place for the couches. We were seated within ten minutes and briefly perused the menu (although I had already checked it out at home, of course.) From previous visits, I knew that I was a fan of their meaty, thick-cut turkey bacon, and thought that I’d be ordering from the breakfast side of things. 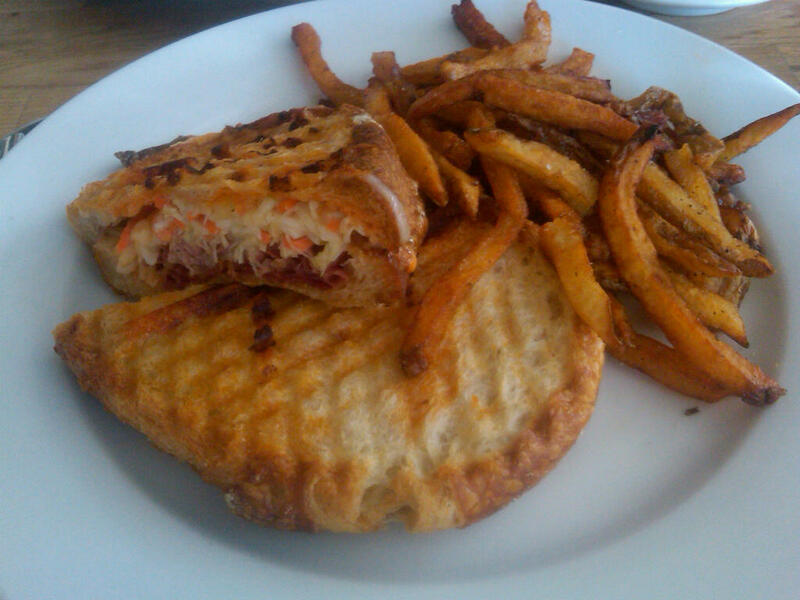 Instead, a special caught my eye–beef bacon reuben. I like beef, for sure, and I like everything about a reuben. That was a winner for sure. It looked awful tasty when it came out. Look at that carrot-flecked slaw! 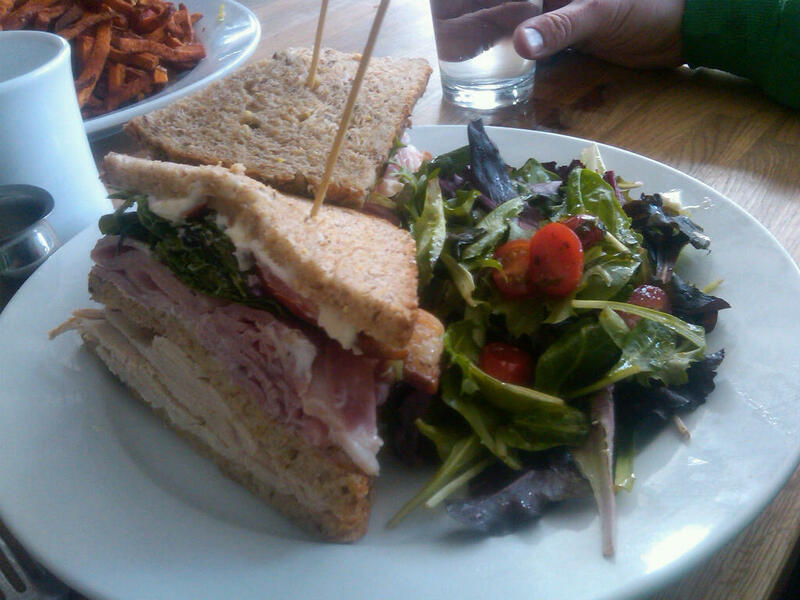 The sandwich was as good as I expected, if not better. The beef bacon wasn’t really bacon at all. It was kind of just corned beef (or something like that) but I didn’t really care. It was awesome. The sandwich was pressed so all of the flavors were melded together and each bite was simply delightful. My father-in-law got the BLT with sweet potato fries. I didn’t get a photo of it because the poor guy was so hungry I figured I’d just let him eat. My husband and mother-in-law both got the club with “off the bone” turkey and smoked ham. Check this bad boy out. We’re talking Koch’s sizes here, folks! With two kinds of meat (there were special raves for the carved, non-lunchmeat turkey,) this sandwich is a bang for your buck at $8.50. My husband hadn’t eaten all day so he managed to finish off most of the sandwich and my father-in-law helped my mother-in-law with hers. Overall, this was the best experience, and certainly the best food I’ve had at Green Eggs. I look forward to going back and hope that my expectations continue to be exceeded.